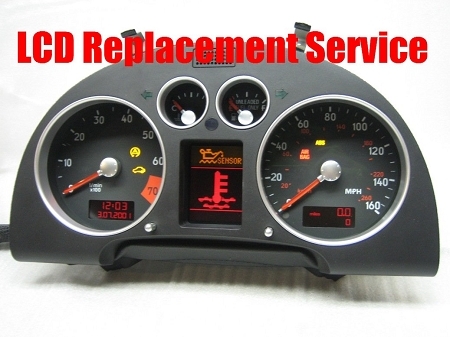 Repair / LCD replacement service for Audi TT instrument cluster. The 2000-2006 Audi TT instrument cluster is notorious for failing after few years of use. Failures include pixelated / faded LCD driver information center display. We will reuse your current Temperature and Fuel Stepper motors. It is assumed that you are not experiencing false overheating (faulty Temperature motor) or false/high fuel level reading (faulty Fuel gauge). When the Temperature and Fuel stepper motors fail, they will start shifting to the right indicating overheating or more fuel than actual. Based on our service experience, 90% of Audi TT instrument clusters arrive with at least one failed stepper motor for Temperature or Fuel. Please see our other LCD Replacement Service Option (including New Temp/Fuel stepper motors) and Full Service Cluster Rebuild option if you are also experiencing other cluster related issues/failures common with TT models, such as: inaccurate, erratic or non functioning temperature/fuel/speedometer and tachometer, power loss, battery drain, flashing or disappearing clock and odometer display. All models of Audi TT (2000-2006). Please note that the repair will not affect your immobilizer (if equipped) or odometer status. You will receive the same instrument cluster that was shipped in for repair. Cluster will be plug and play and no coding/re coding is required by the owner. The immobilizer will be configured so that the car starts without any delay or lockout time. Repair process involves removal and shipping of your current instrument cluster for repair. The repair is processed within 1-5 business days, plus shipping/transit time.